To succeed with money in general and to increase your income specifically, one of the first steps you need to take is to purposefully spend less in order to reduce ongoing expenses or lower your cost of living. As you will see, to spend less can significantly help you increase income. There are several advantages in making an effort to reduce expenses. The most important one for this discussion is that many aspects of increased earnings require some investment (money), often not much, but some. To succeed with money, one of the first steps you need to take is to purposefully start spending less. For example, one of the common needs is in the area of education. A couple of classes at the local vocational school might be just the ticket for a new job, but you have to set aside some money to pay for them. Cutting back on spending can make this easier to do. There are many ways to start a new business these days, often on a shoestring. But even shoestrings are not free! Any kind of start-up business requires some capital. If you spend less you could have money left for investment in a new business. There are other options as well. The greatest income potentials are through investing, but this too takes money. The only way to have money to invest is to reduce expenses enough to have money to invest. 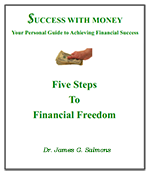 Most important however, as with nearly every other aspect of financial achievement, getting in control of your money is a vital prerequisite for earning more money. When you set out to spend less you are prodded into learning control. If you have not done it already I recommend studying my section of articles, Take Control! This hard to find information is crucial for success with money. Without effective control any income increase will just be dissipated into thin air. Learning to control your money enables you to reduce expenses and frees up money that you can use to help you increase income. Learning control enables you to reduce expenses and frees up money that you can use to help you increase income. When you spend less it allows you to direct your money toward that end. So control is vital if you want to lower your expenses. There is a new public interest in finding ways to shave a few dollars off expenses. There is a high likelihood that we are on the verge of another turn in the auto industry toward high mileage vehicles. That often happens naturally when gas prices go up or artificially when the EPA imposes new mandates. Flip the channels on your TV and you will find all sorts of financial call-in shows answering people's questions about money. Many of them give tips for saving money in various ways. But it needs to be more than a fad or something to deal with a few specifics like saving on sports or music events. What is needed are positive, permanent habits relative to getting the best prices for all of our ongoing expenses. A really good book dealing with these issues is one by David Bach titled, Fight For Your Money: How to Stop Getting Ripped Off and Save a Fortune . Information in the book will help you deal with the real expenses of life, everything from insurance to automobiles to credit cards, taxes and cell phones. After getting in control of your money and developing a basic spending plan, one good approach is to work slowly and methodically through your expenses, learning to lower expenses or eliminating as many as you can over time. Look at alternative ways to meet your needs and choose the best way to achieve your goals with the least expense. Work slowly and methodically through your expenses, learning to lower expenses or eliminating as many as you can over time. In the end your best resource may be your own mind and ability to think through your potential to reduce costs. For example, think about saving money on car expenses. Could you save driving mileage by grocery shopping once a week and picking up milk and bread from the convenience market on the way home from work? The important thing is to first get in control of your money. Next take steps to reduce expenses as much as seems appropriate in your circumstances. Spend less everywhere you can. Then, finally, plan and put into place those steps which will best support your increased earning goals.